( commit "video codec: refactor userdata release mec hanics in categoriser" reverted ). I have also an issue with one dvd, where i would like to try, if this fixes it. edit: i saw now, you also fixed the problem with deinterlace and video in background in the Isengard thread. Is firmware here and in the Isengard test builds the same, always the newest ? (2015-08-14, 15:46)keynet Wrote: Crash? Then you'll have a crashlog. Please paste the url not the log! Also, for some reason your log is incomplete (maybe because of the way you pasted it, hopefully) and doesn't contain the information relevant to the actual crash. Yes, Milhouse builds and the Isengard test builds will always contain "top of tree" firmware. I have actually spent the last few hours pulling apart the "refactor userdata". I've got it down to just a few lines that used to be in the code and no longer are. Adding those few lines does allow your dvd file to play. so it should be in tonight's Milhouse build. I'll also update the Isengard builds shortly. (2015-08-15, 19:15)Milhouse Wrote: Please paste the url not the log! "Small" round here is less than a dozen lines - more than that, use a paste site. Unfortunately if that's the entire log then something killed gdb as it was creating the crashlog, rendering the log unusable. Thanks popcornmix! 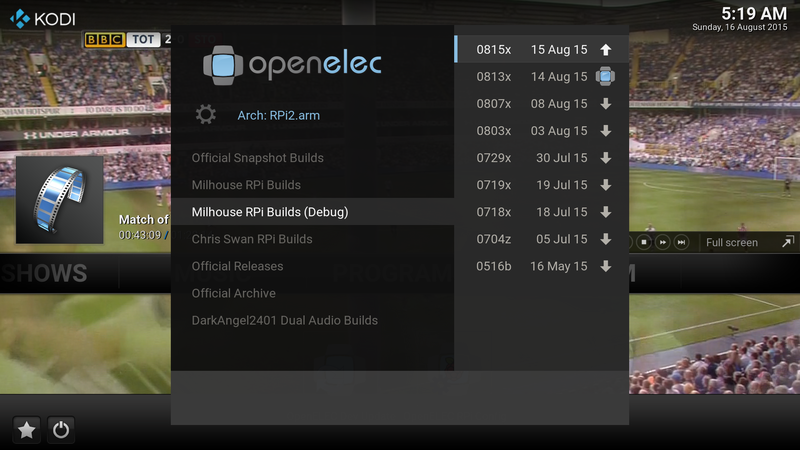 I downloaded the firmware update and copied it to my rpi2. Based on the existing file sizes, I guessed that the right files were the ones with the _x but named without that. The update appears to have been a success and I no longer get crashes when skipping with advanced deinterlacing enabled. As a bonus, my rpi2 only runs at the maximum overclock speeds I have configured when video is playing. Can't wait to try the official build tonight. New build is rocking advanced deinterlacing as well. Thanks popcornmix and Milhouse! Latest debug-enabled build #0815x: RPi / RPi2. Requires FAT partition >= 384MB. Hello all, been busy for a while with life, but school starts soon so I'll have more free time to play with this stuff. I have only been upgrading very intermittently, and I promise I'll start doing daily updates again soon to help track down problems. I've been having some little audio dropouts when watching live TV. I use a Mythbuntu back end, HDHomerun tuner and RPi2 for the front end. I'm currently running the latest build 0815 from this thread. I've included a log made after rebooting everything and was wondering if someone could look at it and tell me if there is anything wrong with my configuration that might be causing the audio drops every few seconds. I have no idea where to look. Maybe I need to adjust my clocking or memory split? EDIT: It looks like if I pause the playback for a few seconds, the problems goes away. Is that some kind of underrun? I adjusted the Settings/Video/Acceleration/Audio Output Latency, but that doesn't seem to fix it like pausing does. (2015-08-16, 02:56)afremont Wrote: I've been having some little audio dropouts when watching live TV. I use a Mythbuntu back end, HDHomerun tuner and RPi2 for the front end. I'm currently running the latest build 0815 from this thread. I've included a log made after rebooting everything and was wondering if someone could look at it and tell me if there is anything wrong with my configuration that might be causing the audio drops every few seconds. I have no idea where to look. Maybe I need to adjust my clocking or memory split? What video sync method are you using Adjust PLL, Resample Audio or is sync disabled? And which deinterlace method are you using? A debug log (wiki) would be more useful/informative. I would also suggest you contact the MythTV maintainer for help with all the MythTV errors that are present in your log. (2015-08-16, 01:47)Milhouse Wrote: Latest debug-enabled build #0815x: RPi / RPi2. In the Dev Update add-on I've added the debug builds as a new source. It is only enabled if the FAT partition is >= 384MB.